Laughing is a form of exercise based on the philosophy of ‘acting happy’. It is a life changing attitude to choose happiness and a lighter appraoch to form a positive mental approach but also change your breathing. It's a change anybody can choose. 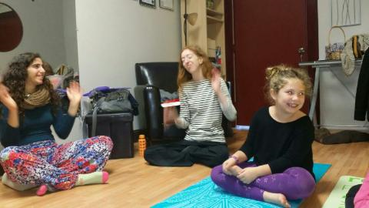 Laughter Classes are a body-attitude approach to life- choosing to actually schedule to practice laughter. Hatha Yoga is a laughter class that was first developed in India by an Indian physician. Now laughter yoga has become popular worldwide with an estimation of 6000 laughter clubs in 60 countries. We all face stress in our daily lives and laughter is best medicine to wind down the contradictory effects of stress and negative thoughts. Laughter is not a mental process. In order to practice laughter classes one need NOT depend on jokes or humor. Laughter is universal language which also builds good communication and enhances inter-personal relations. Scientists have proved that even when we laugh in contemplation of laughing our bodies will get the same health benefit which it would get from a hearty laughter. Laughter has got world of health benefits, it makes it easier to cope with life and its challenges. Laughter is the only moment where we can experience happiness. People who don’t laugh often are the ones who worry more than the ones who do laugh often. People who look at the bright side and take an approach to find humor and laugh have a lighter side to them and their lives tend to be "easy going" and less serious. They learn to develop the ability to tolerate even intolerable situations. Laughter also helps us to stay miles away from fear and anger. Laughing helps release those negative emotions which helps us in relations with others. Laughter makes us feel repose as it releases happy hormones called endorphins, which are produced by the central nervous system which can cure depression. Having fun makes us feel good about life. Laughter can boosts good communication among people and have a positive effect on others. Laughter adds more joy into our lives. You may begin laughing alone anywhere at any time. You have to decide to take the high laugh road. LAUGHING IS CONTAGIOUS! When you have decided to laugh, "laugh like no one is watching" and feel free and happy about it. You may start training yourself by watching a Stand-Up Comedian and see how you feel after...you could schedule to think about some funny times and memories and laughing about them every time you take a shower! 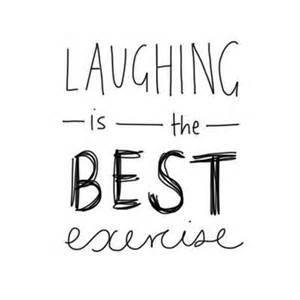 Try our Laughter Sessions and Classes, or seek Laughter Classes or join a Laughter Club elsewhere and you'll see laughing along with a group can be pretty fun! Experience childlike playfulness like . laugh as often as you breathe and love as long as you live! So loosen up, move out of your comfort zone and laugh for no reason!